A walk in the park on a crisp fall day, tossing a ball with your kids in the backyard, or running through the rain. These are the simple pleasures we have in life that we enjoy every day but don’t give much thought to. They are the little things we take for granted when we have mobility. I have leapt though tires on one leg, ridden my bike for 28 miles and skied down a trail as steep as a wall since becoming an amputee. These are truly amazing accomplishments that I am extremely proud of, but there are many simple pleasures that I have regained as a result of the amputation. These are the simple everyday things we take for granted that I have become well aware of and am now grateful for. Amputating a leg is a pretty major step to take. Living with a leg amputated is not easy and wearing a prosthetic leg brings with it a whole host of daily issues. 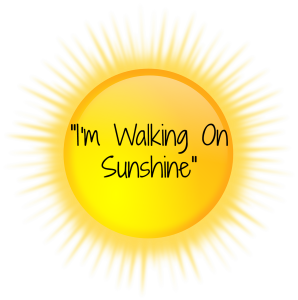 I won’t lie – I’ve had plenty of mornings where I have woken up and thought how nice it would be to just swing my legs out of bed, stand up on two legs and walk without thought. Instead I grab my crutches and hop off to the bathroom, and at some point, depending on the day, I roll on the prosthetic liner, decide how many socks I will need to don, force my stump down into the socket of the prosthesis and pull up the sticky sweltering hot suspension sleeve. There are days where it takes several tries to get the leg comfortable, days I have to change the liner midday due to sweating, and days I go back and forth between the prosthesis and crutches many times, just to keep my day full and productive. My perspective is kept in check when I remember what it was like to drag a dead painful leg around. For me, having choices in how I ambulate is now a luxury. For all the times I lifted that painful aching leg in and out of bed and thought how nice it would be if I could take the leg off and get a break from the pain, I now have that simple pleasure. One of the things I like the most about the amputation is having a choice in how much pain I am willing to endure. A week or two before the amputation I stood against the back of the elevator at work dreading the stop at my floor. Standing with my crutches holding me upright, the deep bone-aching pain was just too much to handle, and the thought of moving was paralyzing. I was at the point where I honestly didn’t know how I would stand living like that for another minute. Pain was not a choice – it was constant. The comfort level of the prosthesis is like the weather, constantly changing. It can go anywhere from surprisingly comfortable, to having discomfort, to tolerable pain, to ‘I can’t stand on this thing for one more minute’, all in a matter of hours depending on what I am doing. I am actually able to tolerate quite a bit of pain because I know that the second I release the prosthetic from my stump, I will have instant relief. I also know that I can switch over to crutches and move pain free. Recently, while out at dinner my prosthesis was causing a painful pressure point on my stump. The burning pain became pretty intense. I then realized I had a choice; I didn’t have to be in pain, so I slipped the leg off while I ate dinner. Having the choice to sit and enjoy dinner without pain was a simple pleasure that was priceless. A few weeks ago, I stopped at the grocery store to pick up a few items. I parked the car, got out, walked into the grocery store, grabbed a cart and proceeded to walk around the store grabbing the things I needed. After paying I picked up the bag and headed for my car. As I was freely walking across the parking lot it hit me just how amazing it felt to simply be strolling along like everyone else. I took the opportunity to truly enjoy living and everything around me. The prosthetic had the discomfort equivalent to wearing a tight uncomfortable shoe, but I didn’t even notice at that time. Life was too wonderful! I am not a shopper, but being able to wander through Target with my wife is another simple pleasure I will never take for granted. For seven years I was torn between walking in pain or sitting in pain. It was always ‘damned if you do, damned if you don’t’. The more I did, the worse the pain got, but as soon as I sat down to relax the aching pain became unbearable. Unfortunately with pain, when you relax your mind slows down and the pain becomes the focus, so relaxing simply became an exhausting battle of fighting pain. A couple of weeks ago I was away at a conference for work. I wore my prosthesis all day and had done a lot of walking. By the time I got to my hotel room that evening I was limping heavily in pain and desperately wanted out of the prosthetic. I slipped the leg off and sat on the bed with Stumpy elevated on a soft pillow. The pain was released from my body and it was truly heaven. That is where I remained, relaxing comfortably for the rest of the evening. 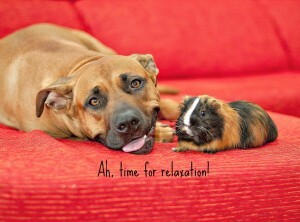 Ah, the simple pleasure of relaxation. Enjoying family time. It is hard to enjoy anything when you are in constant pain. For years it seemed like every time family got together everyone had fun but me. Ultimately I would end up sitting in pain and wanting nothing more than to be alone. It is hard to be in pain, but even harder to hide pain. The more I tried to hide my pain, the more I wondered how my family could be enjoying themselves when I was in such agony. Then the anger would get the best of me. I can now take an exercise class with my kids, spend the afternoon rock climbing with my daughter, laugh with my son as we are lifting a heavy safe into a shopping cart that is rolling away, spend the morning skiing with my wife or enjoying a family hike through a local park. A year ago all of these activities would have resulted in frustration, pain and avoidance. The simple pleasure of spending time with family makes life wonderful. Lack of sleep, no matter what the reason, will eventually take its toll on you. My evenings got to the point where I couldn’t sit in pain for one more minute, yet I dreaded going to bed. Once in bed it was impossible to get comfortable because the priority was to get my leg in a position where it would be in the least pain. Most of the night I would be awoken by massive foot and ankle cramping that then left me lying in unbearable pain for hours. By morning my mind had taken all the pain it could and I would desperately leave the bed in hopes of relief. Immediate post-amputation surgery pain is horrific and for the first week or so sleep is barely possible. I don’t remember exactly when it happened – I would say about three weeks post-op – but I woke up and realized that I’d slept the whole night through without pain. It was amazing. It took a few more weeks of painful nights, but I now look forward to crawling into bed. I sleep comfortably and soundly all night long. I think that for the rest of my life, every morning I will take a few minutes to just lie on my back and appreciate the simple pleasure of pain-free sleep. This past Saturday I went to the gym and worked out without my leg, came home, put my leg on to do some household chores, and then took the leg off to take a swim. After cooling off in the pool I put the leg back on to mow the lawn and do some yard work. After the yard work I removed the leg to cool off in the pool and then re-donned it to make dinner. After the yard work I became frustrated with taking the leg on and off. I almost let not wanting to deal with taking it back off keep me from going into the pool. It just seemed unfair that this was what I had to go through just to walk. I reminded myself what the last seven years of my life were like and how fortunate I was that I could amputate my leg and free myself from pain. So many people live with unresolvable pain and with much worse circumstances. I once again became grateful, to now have the choice between using my prosthesis or my crutches to live a fully mobile life and enjoy simple pleasures again. Take a few minutes to appreciate your simple pleasures. Then live each day never taking them for granted; life can change in an instant and the simple things you never gave a thought are suddenly huge. Thank you for reading! Please subscribe to never miss a post or come back in two weeks for my next post, How to Purchase A Left Foot. Also share and follow on Facebook and Twitter. I live a very good active life. Not by accident though; I made it this way. Challenging myself physically has not only given me confidence, but has made my necessary daily activities easier. 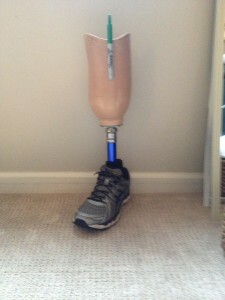 Whether I am leaping onto a 24” pylo one-legged or climbing a rock wall using my prosthesis, the results are the same. I gain confidence, strength, balance and endurance, making doing my necessary daily tasks, as a single-leg amputee, dramatically easier. A year ago, while in the planning and waiting stage pre-amputation, I had no idea what the results would be. I had no idea what I would accomplish physical and really no idea of how I would live as an amputee. When asked a day or two post-surgery what my goals were I had no way of answering the question. The only thing I knew was that I wanted to be relieved of pain, and without pain I would find my way as a single-leg amputee. Post-surgery it didn’t take me long to realize that if I wanted to relieve my phantom pain, being upright, moving and exercising was the magic elixir. The Physical One-Legged Monster was born. A pulled lat muscle led to getting a trainer to work with. With the trainer came the realization that meeting the physical challenges in the gym made me feel capable and confident of physically doing anything I wanted. I didn’t need two legs. With determination, some creativity and a talented, supportive trainer pushing and believing in me, there were no limits on what I could accomplish. Some think I am crazy, and I think they are crazy. I have been asked over and over “why would you do that without your prosthetic?” I have observed that I can post a picture of an amazing feat I have accomplished one-legged on Facebook and it gets some likes. Yet a few days later I could post a picture of me just standing in the prosthetic leg and it gets triple the likes. The power people give the prosthetic leg astounds me. For me, being an amputee is about finding ways to live my life without limits. So why would I limit myself to only being able to do things with a prosthesis? I wouldn’t change one thing that I have done since the amputation, and have absolutely no plans of changing what has given me a fully active independent life. Eight months post-op I don’t give my lack of leg a thought when planning my daily activities because I know I will find a way to do whatever it is I need or want to accomplish. Yes, I have all the inconveniences and annoyances that come with amputation and wearing a prosthetic. However, because I have made my life so active and positive I am able to accept and tolerate the adversities. When I put the prosthetic leg on, I am grateful to have the break from the crutches; when the leg becomes painful, I am grateful to have the break from the leg. Either way I continue living without missing a beat. This is why I am in the gym on one leg flipping tires, leaping onto 24’ boxes, swinging kettlebells and doing squats. Conquering these physical tasks, one-legged, gives me an incredible high and makes me feel powerful. My gains in strength, balance and confidence have made my life full, whole, active and healthy. I would even go as far as saying it’s made it “normal”. When I jumped up onto a new pylo at the gym and my foot landed between the two non-slip pads, I said “it needs to be turned so your feet can land on the pads.” It truly never occurred to me that it was facing the right way, however it was made for two-legged people. To me I am no different hopping around that gym on one leg than anyone else. Why? Because I have made myself just as capable. Eight short months later I pop on my prosthetic leg and take a 30-mile bike ride. I pop on my prosthetic and climb to the top of the rock wall. I pop on my prosthetic and do heavy yard work. I accomplished these things and have mastered a natural gait. Yes, the prosthesis makes these things possible and I am extremely grateful to have it, but it isn’t the prosthesis doing the work. The prosthetic is only a tool; it is all the work at the gym that has made my accomplishments with the prosthetic possible. My body is so balanced and strong that once my stump toughened up and became desensitized, using the prosthetic leg fell right into place. I live an enjoyable, full, active life as an amputee. The physical challenges I put myself though daily with and without the prosthetic has made my life incredible. The prosthetic leg is an amazing thing that allows me to do many things. However, my ability to truly live my life fully independently and active as a single-leg amputee requires much more than the prosthesis. It requires a positive attitude, a strong body and the determination to live my life without limitations. With this a new website name is born. Two years ago when I began building the website and blog I chose the name Living Life On Crutches. At the time it was exactly what I was doing – using a pair of crutches to live my life to its fullest. Today the name no longer reflects how I live and therefore calls for a new name. I am living my life full and complete with three natural limbs instead of four. This will be the last post I make under the name Living Life on Crutches. My website/blog, Facebook page and Twitter handle will be changed to reflect my new life, Life Beyond 4 Limbs. This website and blog is the first step to forming a non-profit organization under the same name, with the goal of helping amputees regain and live full active lives. The organization will include peer mentoring, support groups and giving amputees what they need to return to full active lives though exercise and physical sports challenges. I used my ability to take on physical challenges to support the American Diabetes Association by participating in the Tour de Cure biking event and will support St. Jude by participating in the Warrior Dash. My goal is to continue to use physical challenges to help amputees through my organization. It would be awesome to have an amputee partner or two riding along with me in next year’s Tour de Cure. The content of the site will remain the same. All current subscribers, FB page likes and Twitter followers will be carried over. You will not need to do anything different to continue receiving blog and Facebook posts or Twitter tweets. What’s a St. Jude Warrior? This has been a milestone weekend. I accomplished another physical goal as a lower leg amputee, eight months post surgery. 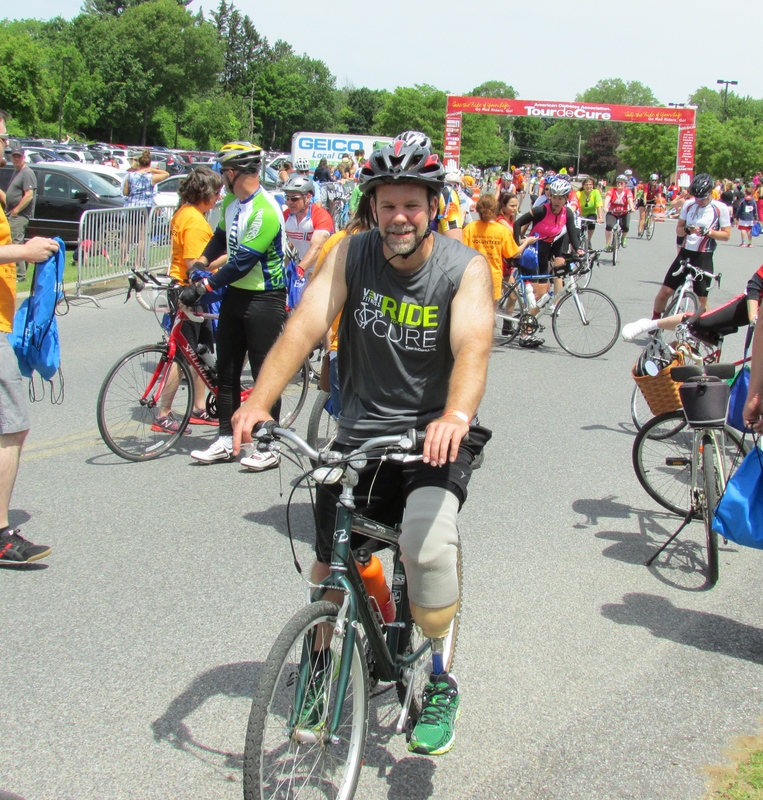 The milestone was successfully completing the 28-mile route of the Tour de Cure bike ride. On to the next physical challenge! For the past 2 months I have been preparing for the Tour-de-Cure, a bike ride event that benefits the American Diabetes Association. 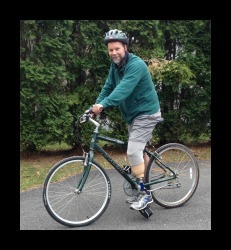 When signing up this spring, I had not yet given biking with the prosthetic leg a try. I wanted to make this a challenge while keeping the distance realistic, so decided on the 28-mile route. I realize that for someone who cycles regularly 28 miles is nothing, but for an amputee 8 months post-op it was a lofty goal. I not only worked up to the goal of riding the 28 miles, I accomplished it. Pedaling into that finish line 8 short months after the amputation of my lower left leg was exhilarating. What could be better than using my ability to put myself through a physical challenge and raise funds for a worthy cause? I am not finished yet, as I have my next physically challenging fundraising event only six weeks away. Interestingly, I actually signed up for my next challenge months before signing up for the Tour-de-Cure and it is going to be a massive physical challenge. My trainer might be a “two-legged freak” but in this case she is justified in calling me a “crazy loon”. In my cocky state of swollen-headiness after satisfying my first two challenges, TRX Certification and conquering the box jump, I was a bit overzealous and signed up for quite a feat. No worries; I move onward and upward to become a “warrior” – a warrior of St. Jude by completing the Warrior Dash. I will have some companions in this challenge. My 14-year-old daughter and 17-year-old son will be my partners in crime as we crawl, roll and jump through mud and become St. Jude Warriors. For those of you who have no idea what the Warrior Dash is, I need to warn you that if you participate you will get dirty. The Warrior Dash is a 5K run with a few interesting twists; to say the least, you have to conquer a little more than running 3.2 miles. 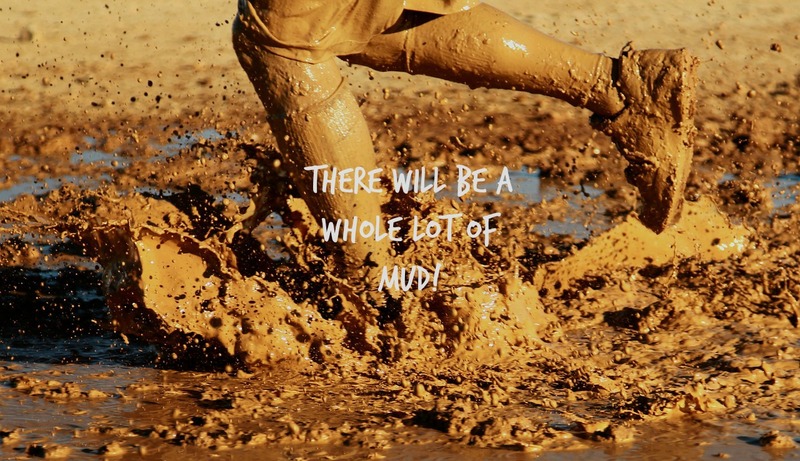 Along the 3.2 miles you face 12 challenging obstacles and they will involve a lot of mud. We will be crawling underneath barb wire in mud, climbing wooden domes, ropes and nets, and free-falling back to the ground. We will be crawling through mud trenches and climbing over mud mounds and jumping over fire to get to the finish line. This is not an event for the faint of heart. It’s not the obstacles that concern me. My work in the gym has prepared me well for the obstacles and I am not afraid of a little mud. It’s the 3.2 miles I am concerned about. The New York event takes place at Windham Mountain ski area and therefore the race is on hilly terrain. 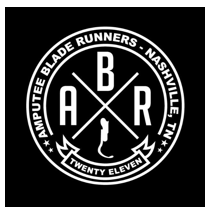 This would be an excellent time to own a running blade, but I do not. I currently have an ill-fitting temporary prosthetic leg and it is not going to make the grade. It was not built for running of any kind; the socket is now too big so wobbles with just basic walking, and it has no ankle either, making for a very stiff foot. Walking on any incline can become difficult and painful very quickly. I am in the process of getting my definitive leg built, but I don’t think this will be the best place to break it in. The new leg will be a high-functioning leg, however if it is ready in time, it will be only a few days old. Mud would get caked into every possible nook and cranny of the prosthesis inside and out. I don’t think my insurance company will pay for a replacement leg due to trashing a pricey couple-day-old prosthetic in the mud. I also don’t know whether the new leg would function for this kind of challenge. 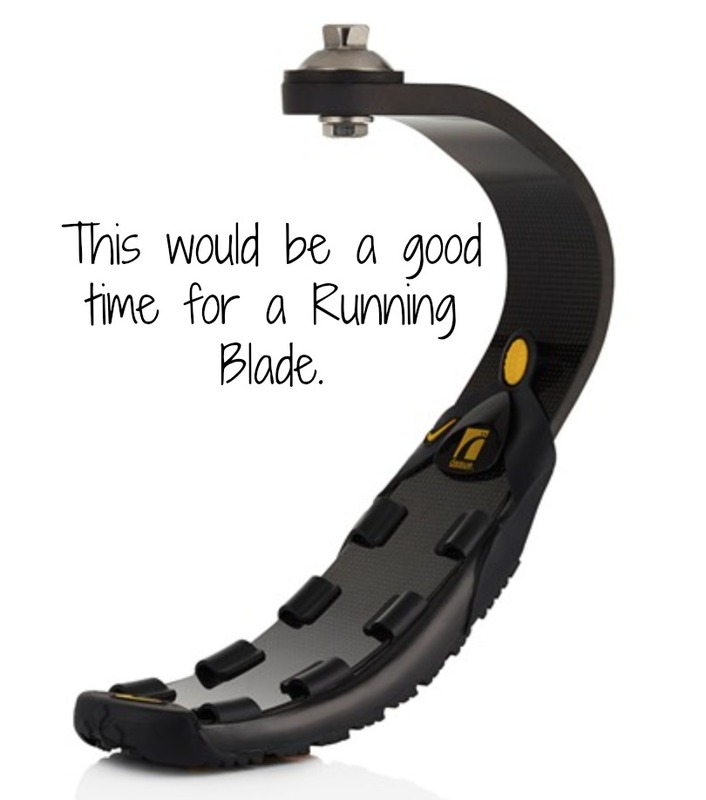 It calls for a running blade, but a running blade is not affordable. So for this challenge, I will be leaving the leg at home and participating on one leg with the assistance of my crutches. While my prosthetic might not be made for this kind of abuse, my crutches are and they have never let me down. They are forearm crutches called Sidestix and they were designed and built for hiking, sports and outdoor abuse, so I have no worries about them letting me down. I will just need to send them through the car wash after the dash. There is a method to my madness or crazy loon-ness! So while the Warrior Dash will be an extreme exertion of my upper body strength, I will make it happen. I have a few things up my sleeve. One, I have basically been using crutches for seven years and they are as comfortable and natural for me to use as most people’s natural legs. Two, at the time I signed up, I knew that without a running blade I would need to do this with crutches. Keeping that in mind I have purposely not let myself become dependent on only walking with the prosthesis. Three, I have been taking 20-minute power crutching breaks at work every afternoon since signing up for the dash in February. Still, this will be the first time I have traveled 3.2 non-stop miles on hilly terrain with one leg using crutches and I will need to put some intense distance training in. For the next six weeks the focus of my daily workouts will be upper body and building up my tolerance and distance crutching quickly on rough terrain. 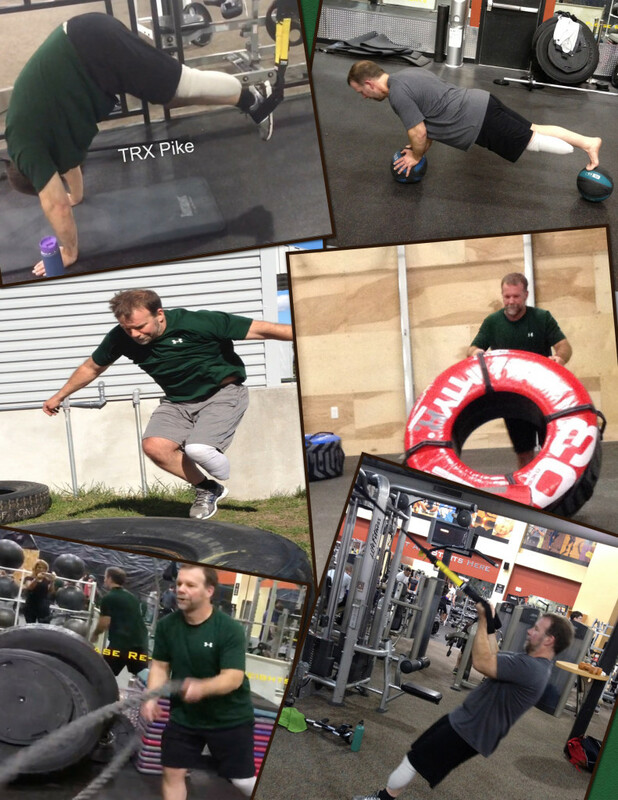 Participating in the Warrior Dash will be much more than me meeting a physical goal. Indeed, this is about the children who need St. Jude Children’s Research Hospital. These children are fighting for their lives and deserve to get back to school and back out on the playground. They deserve a chance at life. Once again I will be using the determination and physical ability I have been blessed with to meet a demanding challenge to raise necessary funds to fight and treat pediatric cancer. I also hope that being a One-Legged St. Jude Warrior will show that with determination anything is possible. Never Give Up! I will be fighting pain to the finish line, I will get muddy, but I will complete the dash, return home with my healthy teenage children, shower and my fight will be over. The children who these funds will help will continue to fight for their lives. Help me give these children a chance. Please help me meet my goal! Go to my personal page http://warrior.stjude.org/DPartridge and make a donation to help St. Jude give children fighting cancer a chance. Thank you for reading! Please subscribe to never miss a post or come back in two weeks for my next post, why I challenge myself. Posted in Uncategorized	| Comments Off on What’s a St. Jude Warrior? How many times have you heard or used the expression, “Just like riding a bike”? This expression refers to any skill that, once learned, you will never forget. While I have found this expression to be accurate, I have also learned that circumstances in life can make even riding a bike a skill to relearn. Who would have ever thought that figuring out how to keep your leg attached to your body would become a bicycling skill? I knew that lower limb amputees ride bikes and I had no doubts that I would be riding eight to ten miles in no time. 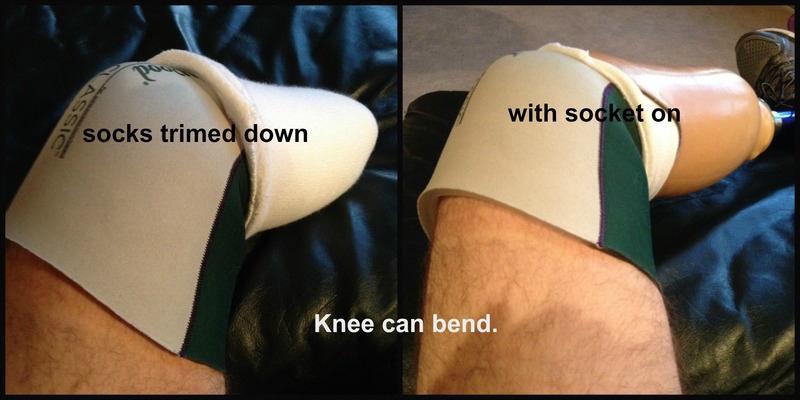 As with so many other things, as a new amputee I would need to relearn, do a little homework and make some adaptations. At the end of March spring seemed to be stuck in a weather jam, delaying its arrival. So, in preparation for figuring out the bike riding with a prosthetic leg I joined a spinning class (indoor cycling) at the gym. My initial plan was to do the spinning class without the prosthetic leg. My prosthesis is considered a temporary leg, meaning one that is used to learn to walk with and get me by while the stump is taking shape. While my temporary leg is a very good one, I have not yet been comfortable using it for anything other than basic walking and doing household chores. I simply find that for my level of activity, I am more comfortable, agile and capable one legged. On the day of the class I decided that there was no time like the present to give biking with the prosthesis a try, so I donned the leg and headed off to the gym for my spinning class. I confidently walked into the spin room and mounted a bike. Then. with the help of the instructor, who was my trainer Holly, I managed to get both my foot with blood pumping through it and the plastic-covered carbon fiber foot strapped into the pedals. Now settled on the bike I gave pedaling a try. Wearing a gel liner, layers of socks and the silicon suspension sleeve pretty much renders the rage of motion in my knee just barely enough to make a natural gait. So surprisingly, other than the pinching in the back of my knee with every turn of the pedal, pedaling really wasn’t that bad. The class then began and I pedaled assiduously with no problems. Then the music picked up and Holly instructed us to increase the incline, come up off the saddle and pick up the pace. So I did just that; I went into standing position on the bike and gave it my all. My legs were pedaling rapidly, the end of what is left of my tibia felt as if it were boring a hole through my skin and with every pump of the pedal a vice was clamping down on the skin in the back of my knee, but I was keeping up with the best of them. Suddenly I hear a crashing noise beneath me. I quickly look down and realize that I have pedaled right out of my leg. Still attached to the pedal by the foot, the prosthesis was off Stumpy and had toppled over on the floor. I quickly reached down, pulled it off the pedal and completed the spin class pedaling with my one leg. Where did things go wrong? There were a few issues with biking with the prosthetic leg. The first being all the layers that are required to make the prosthesis comfortable and keep it on. A gel liner about an eighth of an inch thick is placed over Stumpy and comes up over the knee. At that point my friend had shrunk considerable since the leg was made. To account for the change in Stumpy’s size socks are added to take up the space. At the time of the spinning class I was wearing 10 ply thickness socks over the liner, which is the equivalent to wearing ten layers of basic cotton socks. The layers were topped off with the suspension sleeve, which is another eighth of an inch thick. In total I probably had at least three quarters of inch of layers around my knee. Trying to pedal a bike with all those layers tightly fitted around your knee is like riding a bike wearing a knee immobilizer. It is very difficult and painful to maintain the range of motion necessary to pedal a bike. The second issue that came into play was that the pedaling of a bike causes Stumpy to lose volume. Fluids get trapped in the tissues, causing swelling. Indeed, exercise aids in releasing the trapped fluid out of the tissues, and it also increases blood circulation that helps to flush out the excess fluids. So, the pedaling was pumping the fluids out of Stumpy, causing it to rapidly decrease in size and making the socket loose. The final problem was that the suspension sleeve is designed to stick to the top of the socket and the skin on the thigh helping to hold the prosthesis on. The suspension sleeve is made of silicone and is pulled up over the socket and thigh to create an airtight seal between the thigh skin and the top of the prosthesis. The more skin-to-sleeve contact, the stronger the hold. With all the layers underneath, only about two inches of the suspension sleeve made contact with the skin. Add in the moisture from the sweat and the suspension sleeve slipped right off. While I seriously considered duct-taping the prosthesis on, I felt it not a wise idea. It would hurt like hell pulling duct tape of my hairy Sasquatch leg. I needed to reduce some of the layers around the knee and find a way to hold the prosthesis on more securely. I wanted to take a gel liner and trim it down to about an inch above the socket. This would greatly reduce the thickness around the knee and make a huge difference in range of motion. It would also give considerably more skin-to-sleeve contact, helping to hold the leg on. A gel liner cost $250+, so after much searching online I found a gel sock. While my prosthetist would have a heart attack, I ordered it despite the warning that it should not be used as a liner. When it came I tried it on. It was not as thick as the gel liner but not as stiff either. 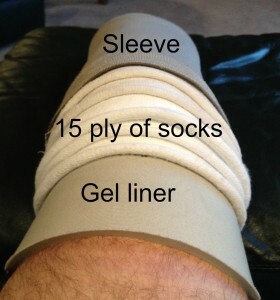 With the gel sock and all 15 ply of socks I could bend my knee with much more ease. However, the problem was that I couldn’t bear weight and I still had space in the socket that needed to be filled. The sock was packaged with a 1-inch piece of foam rubber stuffed in it. I took the foam rubber and folded it over the end of Stumpy and then held it in place with the socks. While it was painful to take more than a few steps, I hoped it would work adequately for pedaling my bike. My troubles happened when I stopped for traffic at the end of my street. I put my real foot down on the pavement while I waited for the traffic so I could cross the road. When I got a break in traffic, I quickly brought my blood-flowing foot back up on the pedal. In doing this I lost balance and toppled over on the prosthetic leg side. I was sprawled out in the center of the road at the intersection of the main road and my street, my fake foot strapped in the pedal and the bike on top of me. Luckily the prosthetic leg took the brunt of the fall and I was not hurt. Although stunned for a few seconds, I released the foot from the strap and staggered back up on my feet as quickly as possible. Feeling discouraged, I got back on the bike without strapping the foot on the pedal and headed back to my house. By the time I got back to my driveway I realized that I could pedal better without having the foot strapped in. I turned around and went back to the end of the street and crossed the main road to the bike path. I successfully biked approximately a mile. Marker is the center of the front of leg. After I returned home and began to walk back into the house to switch back into my proper liner I realized my foot was rotated inward. The fall had put enough force on the foot that it rotated it. On the positive side the next morning I corrected the foot aliment with an Allen wrench as per instructions from my prosthetist over the phone. If it had been a real leg I would most likely have been in the hospital having surgery to repair a broken bone. Over the next week I had an epiphany. It would be smarter and much cheaper to shorten the socks vs the gel liner. I quickly went online and ordered the equivalent to 15 ply of extra socks. When they came I trimmed them all down to the top of the socket of the prosthetic leg. This way I had the layers to fill up the space where I needed them, but I was not straddled with all the extra bulk around the knee. Not only did this solve the biking issue, but it also took considerable pressure off my knee for walking. I will be participating in the Tour-de-Cure fundraising cycling event to benefit the American Diabetes Association on June 7th. I will be biking 25 miles. I would be honored if you would consider helping me reach my goal in supporting the American Diabetes Association by checking out my personal Tour-de-Cure page and making a donation. Thank you for reading! Please subscribe to never miss a post or come back in two weeks for my next post, I will discuss the “One limb for life” rule. The following are ten lessons I have learned in my journey of becoming an amputee. 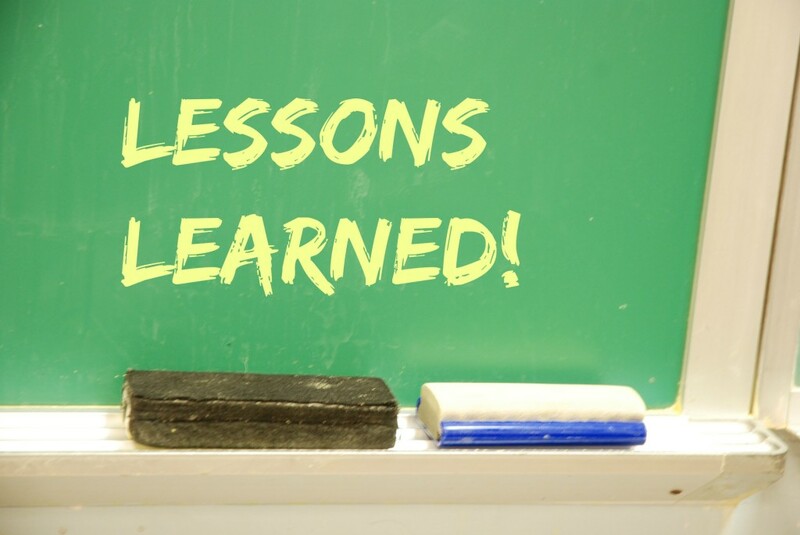 You don’t need to be an amputee to follow these valuable lessons. 1. Determination goes a long way. 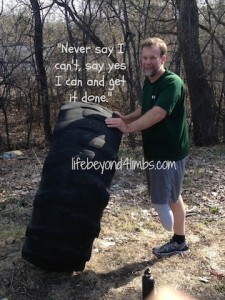 We live so much of our lives saying “I can’t.” The first time I took a shower as an amputee I had to quickly take the “I can’t” out of my vocabulary. The simplest daily tasks we do every day, without thought, become challenging when experiencing life missing a leg. I was fortunate to have the ability to take on the mindset “if it needs doing I will adapt a way and get it done.” With each successfully accomplished task, I soon learned that I could do anything. 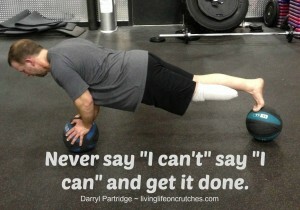 Never say “I can’t” – say I can and get it done. 2. Never take your health for granted. I was a healthy active man in his early 40’s and it all changed with the results of one MRI. A fracture in my ankle led to six ankle surgeries, debilitating pain, years of needing crutches to walk, and ended in a lower leg amputation six and a half years later. Never, ever take your health for granted. Do everything you can to stay healthy and injury free, but this is life and we aren’t always in control of disease and injury. So, every morning when you wake up take a minute to appreciate your good health and then make the most of the day. 3. Make every day count. Ten years ago on my 40th birthday I blissfully joined the seasons pass holders’ ski race with my kids. Three short years later I spent the winter on crutches trying to heal my ankle. The same followed for the next 5 years. All my kids wanted was to ski with their dad, and I was no longer able to ski with them. It was heartbreaking. I have fond memories of that race day, but it was just what we did; I didn’t make it count because I would race with them next year. We can never go back and you never know what tomorrow will bring. Find a way to cherish every day and the special moments while they are happening. 4. A weed in the landscaping is free foliage. My yard was my statuary and I was obsessed with having everything perfect, right down to how each piece of mulch was laid. A weed in my yard was an evil intruder and I would immediately terminate it. I still like my yard kept neat and maintained, but perfection seems silly now. For the rest of my life, just to walk from my bed to the bathroom involves either a pair of crutches or a multi-step procedure to attach a prosthetic leg. Fighting with nature just takes a back seat. A few weeds in the landscaping simply become plants I didn’t have to pay for. 5. Nicks and marks on the walls and woodwork give the home character. For years I fought the endless battle of fixing every nick, scratch and mark my three kids and dog made in the house. I spent my weekends running around like a madman with paint brushes, paint cans, and wall patch making sure no imperfection escaped me. For years after my injury all the marks became magnified and reminded me of what I could no longer do. They have now faded from my radar. When you’re constantly fighting for your mobility, cosmetic things just don’t seem important. The time I can comfortably use my leg is too valuable to waste running around the house covering up the imperfections life causes. The nicks and marks are the character my kids created that make it our home. 6. 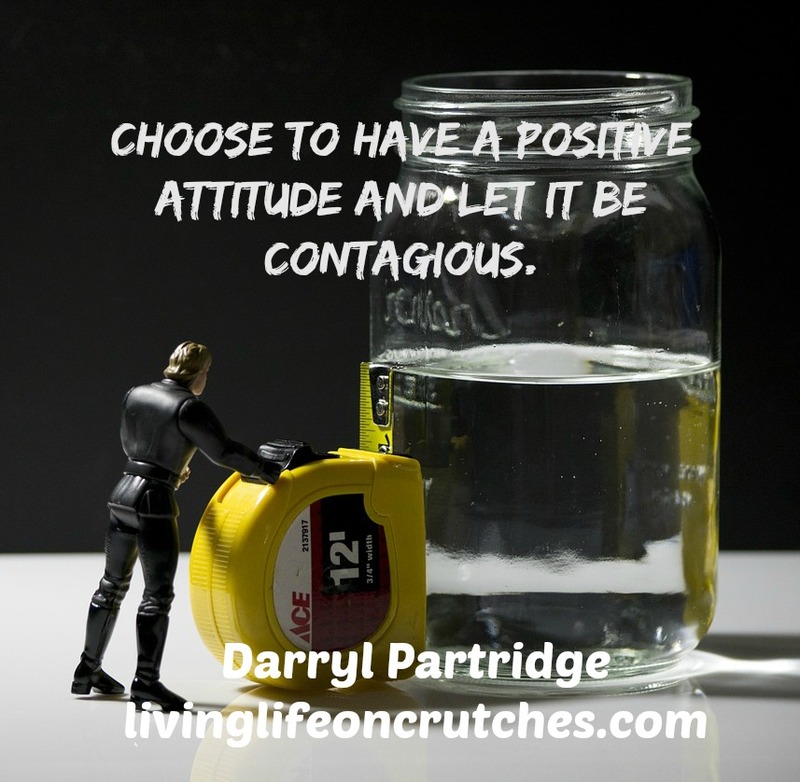 Attitude can be contagious. I present myself as a capable independent human being and that is how I am treated. In the seven months I have been an amputee, very rarely have I felt anything other than respect from people. Yes, almost every day someone opens the door for me, holds the elevator door and lets me go first. Why, because I have one leg. This is just common kindness that we learn growing up. I don’t need this done for me, but I say “thank you, have a great day” and move on. I have never sensed anyone feeling sorry for me or treating me anything other than a capable man. Whether I am using my crutches or my prosthesis, I present a positive, capable attitude and that’s what people pick up on. When someone says “you inspired me to rethink my problems” or “you motivated me to work harder” I don’t get bent out of shape. If someone is inspired to improve their life because of me, it only inspires me to live my life even better. 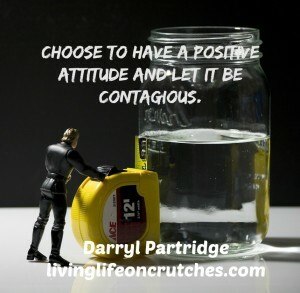 Choose to have a positive attitude and let it be contagious. 7. A pot with scratches and burn stains on the bottom still boils water. One of my obsessions was my stainless cookware. I didn’t want scouring pads or abrasive cleaners used on them. I was afraid they would get scratches. Therefore, I would do anything possible to prevent anyone other than myself from cleaning them. For twenty years they remained looking shiny and new. It didn’t take long balancing over the sink on one leg to learn that the scratches and the burn stains on the bottom don’t change their function. If someone wants to help me out by washing my cookware, I sit back and enjoy the help. A pot with a scratch still boils water; learn to appreciate the help. 8. Life is easier with a sense of humor. I am thankful that my lack of leg hasn’t robbed me of my sense of humor. Every single day since waking up from surgery my sense of humor has made coping easier. It opens up conversation about the amputation, it puts people at ease and lets them know I am good with the amputation, so they should be too. 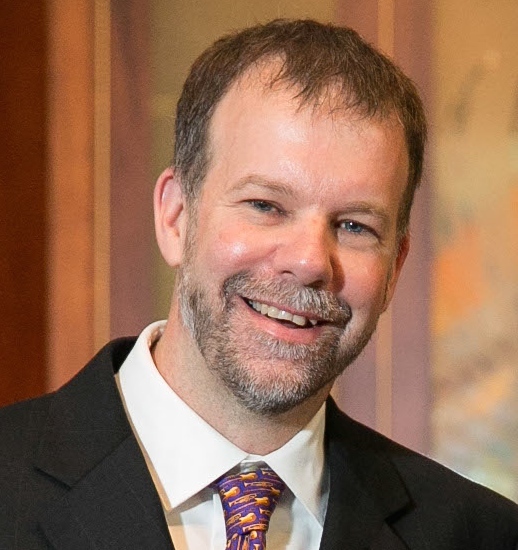 My humor has helped my wife and kids accept the amputation and being able to laugh at all the predicaments amputation has landed me in has aided in my acceptance. For example, a few months ago I was in the grocery store. When I opened the freezer and reached up to get a carton of ice cream my crutch tip went into the freezer. When I went to bring my arm down I realized that I was stuck in the door of the freezer and couldn’t move my arm. My crutch was wedged between the freezer floor and my forearm. By the time my wife got to me to assist, I was laughing so hard that I just about peed my pants. Don’t let getting stuck in the freezer defeat you; find the humor in the situation. A sense of humor can make a big difference in accepting the punches life throws at you. 9. Take notice of those special people who help you along the way. In my seven-year journey with this ankle I have happened upon some very special people who make a difference just because that is who they are. 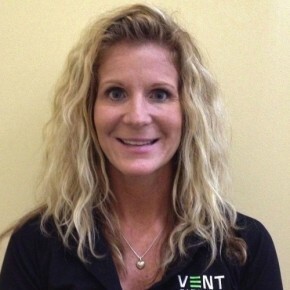 They are amazing professionals who made it their business to care. These are the people who believed in me, helped me, pushed me, encouraged me and never gave up on me. A physical therapist I accidentally met due to an appointment mix up, the orthopedic surgeon I found by randomly calling an orthopedic group and asking for an appointment with any doctor that was good with ankles. A lady who was leading a career counseling group, for free, at the local library and my trainer who pushes me to greatness each week, cutting me no slack for being a one-legged guy. These people had no idea what they did for me, so I made sure I told them. I hope my email, letter or text put a big smile on their face and made them feel wonderful. Don’t focus on the negative people, take notice of those who make a difference and find a way to let them know how special they are. Sending someone a thank you for what they have done just might make their day. 10. Don’t sweat small potatoes. These are the lessons I learned that I now follow every day. They have made me a stronger, happier and more positive person. Once again you don’t need to be an amputee to follow these lessons. 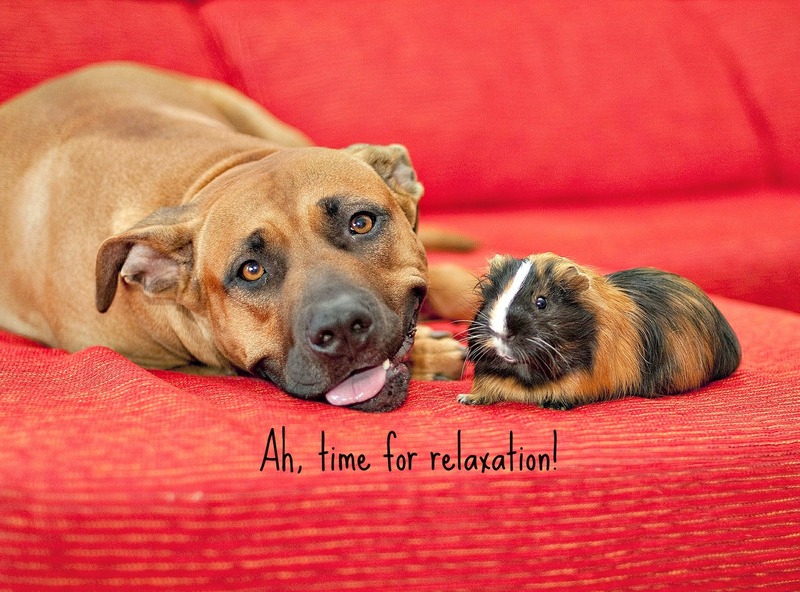 They will help anyone lead a positive and less stressful life. Thank you for reading! Please subscribe to never miss a post or come back in two weeks for my next post, I will discuss bike riding as an amputee.